What are Consumers Doing on their Smartphones, Anyway? Consumer are constantly evolving. And marketers? They might wish consumers would kindly slow down a bit. Change can be expensive. Most marketers are still crawling across the “digital transformation” finish line–they’ve only just implemented mobile friendly sites, personalization, and marketing automation. But today, email is still king – it’s a cross-device channel and unique ID used by 3.7 billion people worldwide – will it be tomorrow? And for everyone? A growing portion of the population already wants to hear from marketers elsewhere. 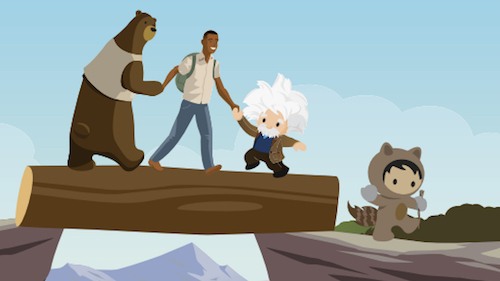 Marketers who want to reach them must start paying closer attention, because each of their consumer segments are migrating to their respective channels of choice. In this article we’ll examine where consumers spend their time on smartphones and how they prefer to be communicated with. Mobile is now standard. Pew Research reports that 77 percent of U.S. adults own a smartphone. That’s up from 35 percent in 2011, making it the most quickly-adopted consumer technology in recent history. That number leaps to 92 percent for consumers ages 18-29. Phones are the portals through which consumers access the world. They’re for navigating, communicating, finding first dates, and asking the important questions, like, “What is Bitcoin?” Yet, it isn’t all sunshine and rainbows. The transition to smartphones has been rocky. Consumers — many of whom wax poetic about a pre-phone age — still struggle to find tech balance. Forty-seven percent say they try to limit their usage by pocketing their phone, silencing notifications, and powering it down at night. Consumers don’t seem to count alternative devices as screen time. Thirteen percent of Americans now own a smartwatch, up from 4 percent in 2015. Fifty-one percent own a computer tablet, up from 3 percent in 2010, and 55 percent of US households sport a smart home assistant. Consumers are nothing short of addicted to smart devices, and they know it. An entire cottage industry has sprung up for apps that limit the usage of other apps. But while the relationship is complicated, smartphones have undeniably become extensions of us. So what do we do when we’re on them? To marketers who have just completed big, arduous mobile optimization projects, you have my sympathy: consumers aren’t surfing the mobile web. 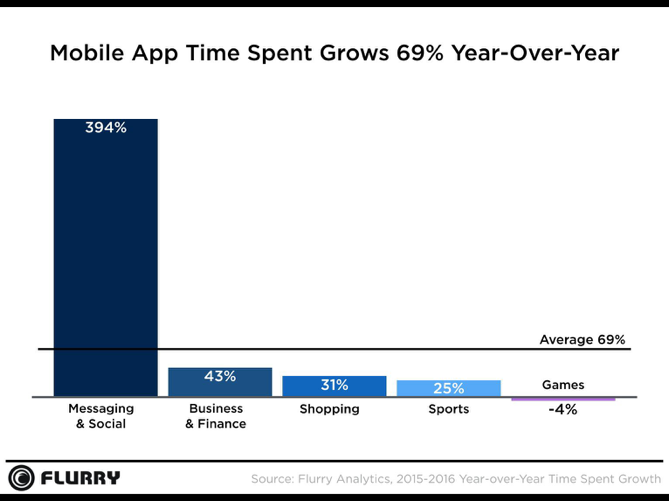 Even though mobile web usage surpassed that of desktop in 2014, it’s dwarfed by time spent in apps. For every minute consumers spend surfing the web on their phones, they spend six minutes in apps. What are they doing in those apps? Lots of stuff. According to Google, the number one smartphone activity outside of work is shopping. According to a Deloitte survey, 57 percent get their news on apps, 45 listen to music, and 31 percent stream films. Twenty-nine percent use their phones as digital wallets, even when purchasing in-store. Many use them as smart assistants, and a growing number use them to hail transportation. One in eight brave Americans have even cut the cord: their smartphone is their only connection to the internet. But the grandaddy all use cases is, without question, communication. In 2016, messaging and social media app usage grew nearly 4x. The next time you’re on a commute or waiting in line, glance over and see what people are doing on their phones. There’s a good chance they have a messaging app open. Seven in ten Americans use social media and 80 percent of that time is spent on mobile. It’s given birth to a whole new pantheon of visual languages – memes, emoticons, and emojis – and many consumers increasingly prefer all communication to come through here. Fifty-nine percent use social media for customer service. But there’s more. The big four messaging apps have eclipsed the big four social networks in size and are outpacing them in growth. Facebook owns the biggest two messengers – Facebook Messenger and WhatsApp – both with around 1.3 billion users. Part of the messaging craze is that consumers, increasingly tired of social broadcasts, prefer one-to-one communication. This is especially true with younger generations, who value privacy. It’s why Facebook launched Messenger, why Twitter launched DM, why Instagram is considering a standalone messaging app, and probably why Snapchat reached IPO. Some, like Facebook Messenger, boast an unheard of open-rate of 90 percent. And for marketers, there should be something satisfyingly familiar about direct messaging: it’s a lot like email. Many of the same rules apply. Only, messaging apps are unspoiled inboxes that consumers still trust. Some, like Facebook Messenger, boast an unheard of open-rate of 90 percent. 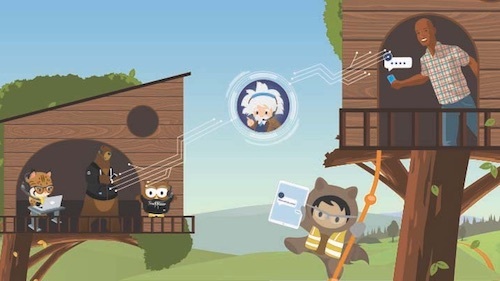 Will your communications evolve too? Many consumers still prefer email. Many will always prefer it. But some segments of consumers want to engage elsewhere. They want to pay retailers with digital wallets like Venmo, get their airline ticket confirmation by direct message via Twitter, and retrieve the hat they lost to a ride-hailing service with WhatsApp. 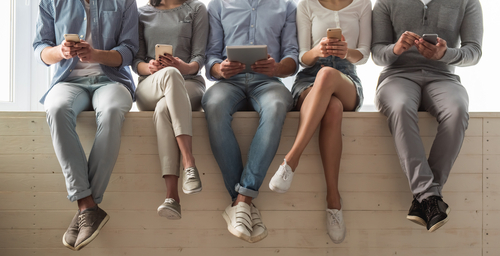 Savvy marketers willing to adapt have spotted these channels of choice and have already begun to build audiences off email. B2B marketers are moving their mailing lists to messenger channels that offer more interactivity. Retailers send coupons and flash sale alerts to loyal fans on Facebook Messenger. Sports teams post stats and engage fans in real-time on WhatsApp. And publishers circumvent inboxes to send alerts that actually get read. You may not be able to stop consumers from changing. But if you know what they’re doing on their smartphones, at least you can adapt to their channels of choice.